In today’s business environment, helpdesk software programs are an essential part of any company, especially those that sell a service to customers or if they are using a software program for their operations. With a reliable helpdesk software solution, companies can streamline their customer support and get important analytics across various customer communication platforms. However, with so many help desk solutions right now, it is understandable that one can get confused when selecting one for his or her company. Desk, Freshdesk, and Zendesk, are among of today’s top helpdesk software programs. While all of these three solutions offer outstanding features, there are nuances to each product that you should check out to find which one is best for your company. This article will provide a comprehensive review of the three solutions, outlining their key features, pricing options, and the type of businesses they usually cater to. You may also want to read our analysis of top help desk software services of 2019. With its amazing score as well as as user satisfaction grade from FinancesOnline.com, Freshdesk is definitely the best helpdesk program available on the market today. After a thorough review our B2B experts gave Freshdesk an outstanding score which makes it a top software in our help desk category. The vendor also provides a solid free trial and freemium plans that let you try out the features and benefits of their tool. If you want to test Freshdesk on your own you can easily get Freshdesk free trial here. Freshdesk offers support for self-service, a ticket management system, and consolidated inbox. Clients can also take advantage of Dispatch’r, the app’s automated categorization and prioritization module. Incoming tickets are immediately categorized and assigned to a helpdesk agent or support group. Once the assignment of customer tickets has been finished, your customer agents can quickly take advantage of the tool’s Supervisor, which is another module that operates by the hour reviewing business rules against your tickets and informing agents when a certain ticket needs immediate attention. For instance, when there is an unresolved ticket from the customer who has had over three interactions, Freshdesk can quickly trigger an email to your company’s manager explaining the details of the ticket. A third tool included in the app, the Observer, is a monitoring feature that allows you to track incoming changes in statuses, messages, or any other events that need a response from your helpdesk agent. For instance, if a VIP or priority customer re-opens a ticket, the tool’s Observer can trigger automatic ticket escalation to assign it immediately to your helpdesk manager. For more information about this software you can read our Freshdesk reviews. If you want to try the service on your own first you can easily sign up for Freshdesk free trial. Zendesk, on the other hand, has a major focus on allowing and managing communications with your customers as well as other support constituents. The tool’s application interface integrates various communications from social media, phone email, and chat services. Collecting requests in one area is just a part of the entire solution. Zendesk offers support for automation rules as well as triggers that respond to various events in your helpdesk system. The tool also provides customers with self-help portals that can be quickly branded based on your needs. Another useful feature of this tool is the capacity to share tickets with other businesses that use Zendesk. This feature can be especially beneficial for companies that offer various products or services that need to be integrated with multiple vendors and providers. What’s more, Zendesk’s helpdesk solution boasts of ticket management and customer self-service features. It deftly uses its knowledge base that can address common customer problems and which can be accessed using a customer portal or through user community forums. Zendesk can also be accessed using mobile devices and integrates well with social media networks. Zendesk also supports voice support with the help of a virtual contact center. This feature can also be integrated with the existing telephony solution in your company. After a detailed review of Zendesk our B2B review team place in our top 10 help desk software listing. While being a solid and reliable option, Zendesk is still outperformed by its big competitor Freshdesk. If you want to a get more detailed look at Zendesk and its features and pricing feel free to read our detailed review of Zendesk. Desk.com is another top helpdesk solution. 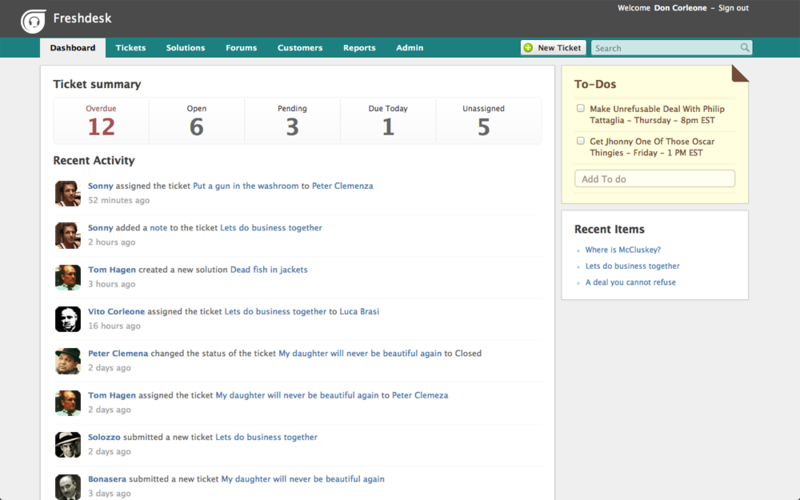 Developed by Salesforce, Desk.com includes similar features that include logging and communicating with customers on support tickets using a wide suite of channels. The helpdesk tool supports workflow automation with the help of configurable rules to manage assignment of the right helpdesk agent to a given issue, and escalation where needed. Additionally the tool supports multi-lingual support and even provides you with customer surveys to rate your customer support team. The tool’s user interface is very intuitive and allows synchronization between your sales and customer support agents. Customer interactions in different media platforms such as chat, e-mail, and social networking sites are accessible in one place. Desk includes an analytics package for optimized performance monitoring, and analysis of your product problems to check improvements or additional new features to help aid the development effort. Our B2B experts analyzed all features and performance of Desk.com and gave it a good score. If you need some extra details about the app’s features and pricing plans you can read our detailed review of Desk.com. Gamification, in simple terms, is the craft of harnessing all the fun and addicting elements that can be found in games and re-applying them to a tool’s productive activities. For Freshdesk, customer support should not only be helpful but also fun. This is why it integrated a gamification component for internal helpdesk agents. Freshdesk’s Arcade is the tool’s achievement system, with particular goals for support reps and leaderboards that can monitor the points they accrue. Your managers can also create customized objectives for your teams. With the gamification feature, agents can avoid the usual burnout that come with providing support to customers all day, responding to complaints and providing answers to irate customers. Zendesk on the other hand does not have an official gamified functionality. However, thw tool’s users can integrate well with third-party apps. 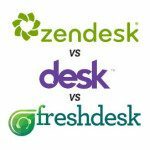 If you want to learn more you may check out our Freshdesk vs Zendesk comparison. Desk.com does not support any gamification features at present. Freshdesk works perfectly for small to medium enterprises that need to use a cloud-based solution for their various customer support needs. Since it became commercially available, it has been able to grow its already long list of satisfied clients even further. In fact, according to its records, Fresdesk has a customer in almost every country in the world. Among these top clients are Hugo Boss, Pearson, Goodreads, Stanford, and Truecaller to name a few. A quick look at these brands and you will notice, these companies are from different industries. This only shows how truly versatile Freshdesk is. Zendesk on the other hand is the tool for any business, big or small, that needs to handle a certain number of clients on daily basis and requires an evolving platform to manage this process. The software solution can be used in media services, government agencies, retail services, finance, software companies, and even education. Public administration offices and non-profit organizations should also find the helpdesk solution to be very beneficial. Among the prominent users of Zendesk include high-profile companies such as Disney, Vodafone, Sony Music, Rovio, Xerox, ad Groupon. Desk.com can support small startups and big firms in various industries that need customer support. Some of their clients include Trip A Deal, SoundCloud, iHeartRadio, and Boloco. While both Desk.com and Zendesk are great help desk solutions our B2B experts found Freshdesk to offer the best quality of service and range of features from all three apps tested. It is possible to enjoy Freshdesk for free with their freemium pricing plan or test the app with their free trial plan. If you want to try it out on your own you can easily get Freshdesk free trial here.